The Thomas Ball Children's Cancer Fund was founded in 1999 by Thomas Ball, then aged 9 and himself undergoing treatment for neuroblastoma stage four which had been diagnosed some 20 months earlier. The main objective of tbccf is to relieve sickness and distress among children suffering from cancer and members of their families. We do this in any way that the trustees feel will be beneficial to the sick child, usually in the form of medical equipment, holidays, special gifts and research. 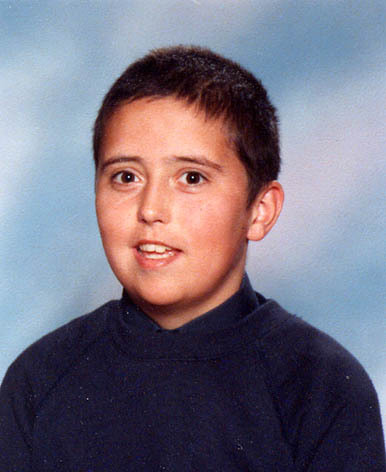 Thomas was the charity's most prolific fundraiser - from sponsored bike rides and swimming to dances, discos, draws and raffles. His idea of an annual garden fete in the Buckinghamshire village where he lived brings in approximately �0 each year. A holiday chalet, known as "Tom's Retreat", situated on the Hampshire coast in New Milton was purchased in 2001, and allowed children with cancer and leukaemia to have a free holiday and a much needed break away from hospital treatments. Thomas helped to choose the chalet, as he knew from experience the sort of things that would help children forget about their difficulties and have a great time. The tbccf Holiday Chalet afforded many children and their families a much-deserved holiday from the demands of treatments and hospital visits. Unfortunately in 2008 the chalet was demolished to make way for a new development. Please visit our Holiday Homes page and take a look at our new holiday homes available free of charge to children being treated for cancer. There are three ways you can donate directly to the Thomas Ball Children's Cancer Fund online - through the Charities Aid Foundation, JustGiving or by using PayPal. If you choose to donate through CAF the Government will give us an extra 28p per �you donate. 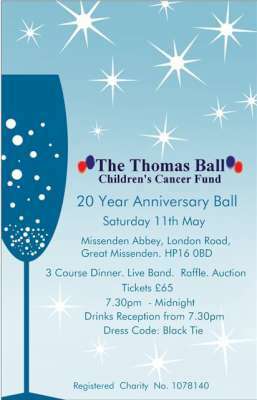 This year marks the 20th anniversity of the Thomas Ball Children's Cancer Fund and we are holding a Ball to celebrate. See our News and Events page for more details. We are delighted to have been chosen as charity of the year for Sainsbury's Local in Prestwood. We are extremely grateful and send our thanks to Chris Wells, president 2017-18 and the members of the 41 Club for their support over the last year in organising refurbishment of our kitchens in both TJ's and Tom's holiday lodges and for raising money towards a new shower room. We are pleased to announce that tbccfhas recently joined Easy Fundraising,a free service where people can register and do their shopping at over 2700 onlinestores at no extra cost, and raise money for tbccf at the same time. The customer still shops directly with the retailer but by clicking through the links from the EasyFundraising website, each purchase made generates a cash back donation to the Thomas Ball Children's Cancer Fund. For example, spend �00 with Thomas Cook on a holiday and you might raise �, insure your car with Aviva Car Insurance and you may raise �, or purchase a mobile phone from O2 and you could raise �.50, and so on. For more information and to register go to easyfundraising.org.uk. We are very pleased to announce that we are the current chosen Charity for TGI Fridays in High Wycombe. The Thomas Ball Children's Cancer Fund is now on Twitter. We are proud and delighted to announce that from October 2010 we are the chosen charity of Coyle White Devine, a legal practice in Amersham, Bucks. tbccf is delighted to announce the opening of "Tom's", a new luxury lodge, following two years of fundraising. Available free to families of children suffering from cancer or leukaemia, this lovely new holiday home will house up to 8 people for a much needed break from the demands of treatment and hospital visits. Read the Bucks Free Press report here. The Thomas Ball Children's Cancer Fund now has a Facebook page where you can find details of upcoming events and read about the fund raising activities we organise. To visit our page and become a fan, click on the Facebook logo above. The trustees are absolutely delighted to announce that Katy Setterfield has agreed to be patron of the charity. Katy was the winner of the BBC's The One and Only with her Dusty Springfield tribute act that was televised in February 2008, she won a three month performance contract to appear at Legends in Las Vegas. 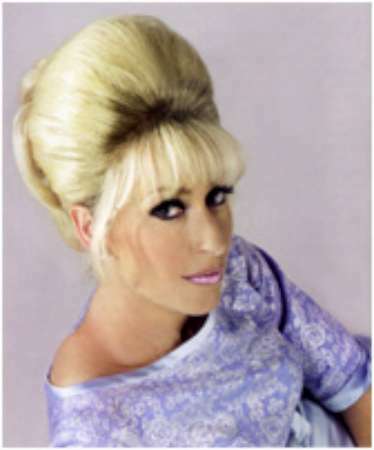 Now back from Vegas, Katy is performing as "Dusty Springfield" throughout the UK from 30-Aug-08 to 29-Nov-08. Already Katy has shown her support for the charity by organising a collection at High Wycombe Swan Theatre which is her home town. �0 was rapidly collected as fans left the theatre after an electrifying, uplifting performance by Katy and her outstanding band and singers. We would like to thank Katy for arranging this and we would also like to thank all those kind, generous people who made donations. The Thomas Ball Children's Cancer Fund is now registered with eBay for Charity, an easy way for buyers and sellers to make donations. Sellers, whether individuals or businesses, can donate a percentage of their sales to tbccf and even add GiftAid to their donations. Buyers can shop for items, whether an everyday bargain or a special auction, knowing they're contributing to our fundraising efforts. In addition, all eBay for Charity items qualify for a fee credit and final value fees equal to the percentage donated. To donate to tbccf when selling your items on eBay, visit www.ebay.co.uk/charity/The-Thomas-Ball-Children's-Cancer-Fund. Neuroblastoma is a solid tumor that mainly affects young children and can be very difficult to treat successfully. Although a combination of chemotherapy, radiation therapy, and surgery can help patients with advanced disease achieve remission, many patients experience a relapse of their disease. Because of this outcome, as well as the side effects associated with treatment, doctors are continually pursuing new, more effective and safer therapies. Vaccines and other immunology-based treatments are being studied in clinical trials and they hold great promise for the control of neuroblastoma recurrence. Cancer immunotherapy is based on the idea that the immune system can be trained to attack tumors. Please help us to translate laboratory findings into effective clinical applications and enable children to have the best treatment here in the UK.